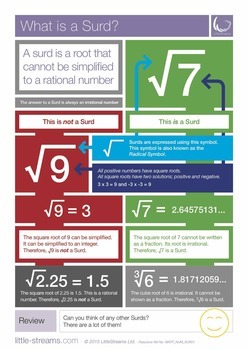 What is a Surd? This is a surprisingly slippery topic. As a teacher or tutor, we might have an understanding of what one is, but there are a lot of loopholes, traps and exceptions. This poster helps! We have found in our research that explanations of Surds often omit certain pieces of important information in order to generate a simpler understanding, only for the student to be told that there are some exceptions to the rules. This poster therefore aims to set a firm grounding on which to build an understanding of surds without having to navigate through the maze of exceptions and loopholes.